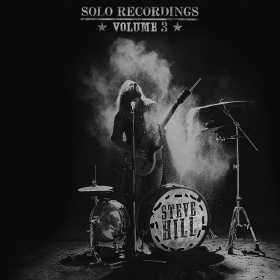 In a world filled with blues-rock trios and quartets, Canadian bluesman Steve Hill stands alone – literally – himself providing all the drums, hi-hats, and harmonica needed to accompany his primary instruments of guitar and vocals. We first told you about Hill shortly after he captured four honors in the 2015 Maple Blues Awards, for entertainer, guitarist, electric act, and recording of the year for his Solo Recordings Vol. 2. Now Hill is back with Vol. 3 in that series, and it’s every bit as good as – if not even better than – his last. Once again, Hill delivers a smoking set of mostly original tracks, ranging from folksy acoustic numbers like “Troubled Times”, the harmonica-laced “Slowly Slipping Away”, and the breezy, Buddy Holly-ish ode “Emily”, to rockers such as the shuffling “Can’t Take It With You” and a hard-driving, groove-soaked “Rhythm All Over” that rivals some of the best from The Black Keys. Truth be told, you know this is going to be another damned fine offering from Hill pretty much from the start, kicking off as it does on the raw and gritty “Damned” with such biting lyrics as “when things are right, I make them wrong/ I never know where I belong/ I screw it up and then I’m gone”. That’s followed by the slightly more radio-friendly, Bad Company-with-a-punch “Dangerous” before Hill turns up the heat on the first of several blues classics with “Still a Fool & a Rollin Stone”. A fierce “Rollin & Tumblin/Stop Breaking Down” comes later in the program, after which the one man band offers an equally fine, albeit much quieter, cover of the traditional “Going Down the Road Feeling Bad”. If you didn’t take our advice and check Hill out after our last review, you’re going to want to do yourself a favor and get on that now. And be sure to tell a friend about him too, for these Solo Recordings are far too terrific for anyone to keep to themselves! This entry was posted in Albums and tagged Steve Hill. Bookmark the permalink.